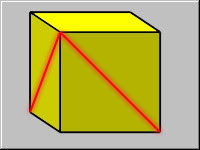 The two red lines meet at a top corner of the cube. Draw another line connecting the free ends of the two red lines. This new line is the diagonal of the bottom face of the cube. Since each of the three lines are diagonals of a face of the cube they are all the same length. Since the three lines meet end to end, this means they form a triangle. A triangle with 3 sides of equal length is equilateral, and the three angles of the triangle are all 60 degrees.